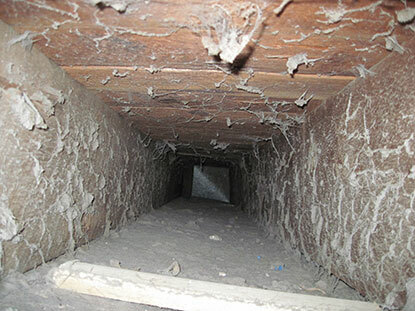 This is a picture of a dirty air duct that is built into a home. This is not a sheet metal or flexible duct, but a wall space air duct. these are no longer code approved as heating and air conditioning ducting. 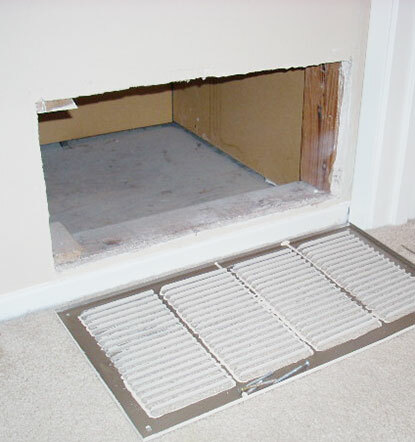 Wall cavity air ducts contribute to poor cooling, heating and indoor air quality. This is the same air duct for heating and cooling as above after cleaning. This picture was taken from an air duct cleaning site. 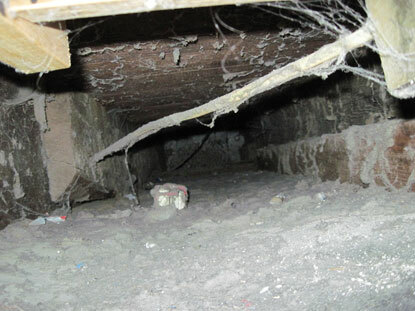 It isn't a clean air duct and it has several problems. The electrical wire going through the duct is not code approved. It takes a very special electrical wire to travel through an air duct, called plenum rated wire, and this isn't plenum rated wire. Notice the gap between the drywall and the wood stud on the left. this gap will allow contaminated air into the home. The interior of the wall cavity duct is not smooth and will cause turbulence when the air conditioner and heater are working. This increases the internal static pressure and reduces the volume of airflow that the heater or air handler can put out. 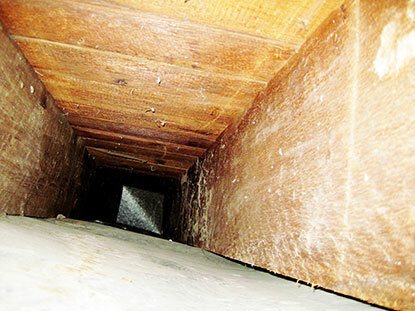 This is another photo from the same web site for air duct cleaning. See the debris on the walls of the air duct and notice how large the gap is on the right between the wood stud and the wall. This gap will allow air to freely traverse between stud bay to stud bay. This type of ducting can never really be clean and will always leak air from the conditioned spaces of the home to the unconditioned spaces allowing for high utility bills when operating the heating and cooling system and poor indoor air quality. 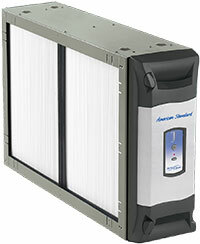 This is often a source for problems in the home for heating and cooling. 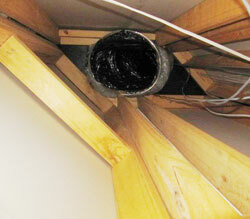 this is an air duct that was not attached properly during new construction. Someone skipped a corner and the result is an air duct that has come apart and it is pumping conditioned air into a wall cavity that freely communicates with the attic. We can help you with all these problems. You just have to let us have a chance to locate those heating and cooling problems that you are experiencing and give you the options that are available to remedy your indoor air quality and utility bill problems. 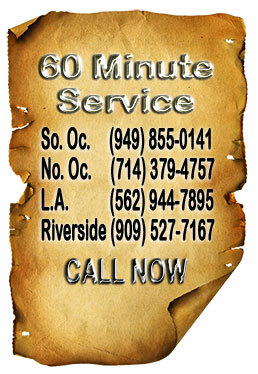 Print out the $39 whole system evaluation and tune up in the upper right hand corner of this web page and give us a call. You will be glad that you did. Using the furnace platform as an air duct is no longer allowed in new construction. 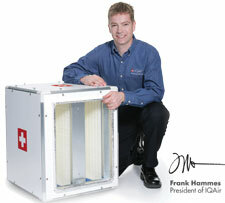 Many cities are now requiring this chamber become a standard duct to prevent air from being pulled in from underneath the platform and from the cracks and crevices in the walls. Notice the gaps at the corners and the gap between the bottom of the wall and the concrete. If this return air chamber is abutting an exterior wall or the garage the air being brought into the house will be contaminated. 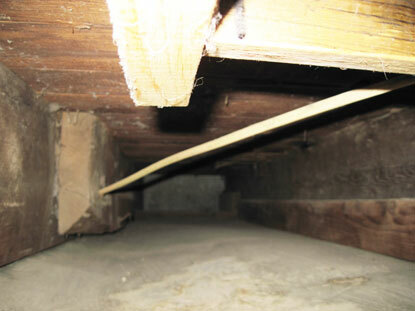 These gaps also allow unconditioned air into the home increasing electrical and gas bills. Many cities are now requiring the retrofit of these return air cavities when the air conditioner or furnace is replaced.